The LMC Stoner has a reputation for being the most reliable, user-friendly and efficient stoner available. The heavy-duty construction offers years of service life with minimal attention. No other stoner can match the ease of operation of the LMC. An exact separation can be achieved with a few simple adjustments. 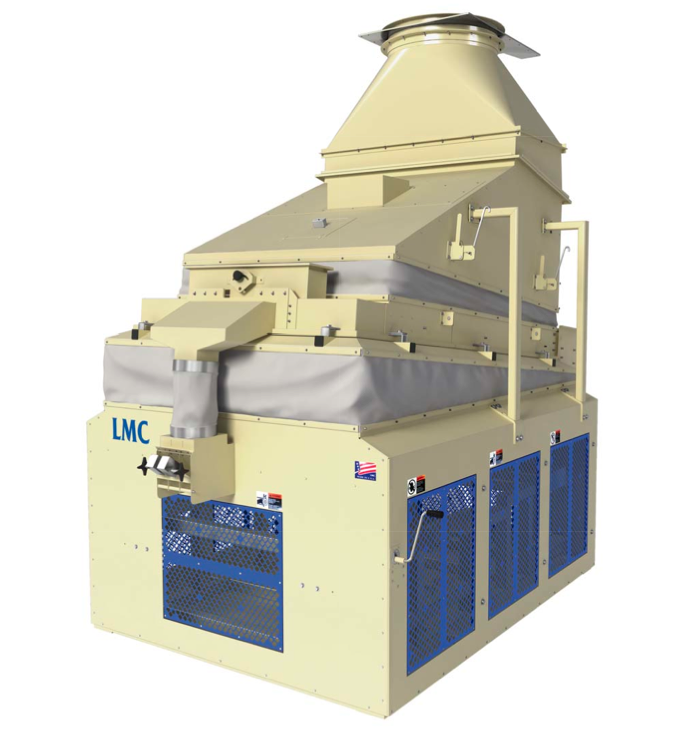 The LMC Stoner is designed with food quality construction standards in mind. The three-component deck system (deck cap, insert, diffusion plate) is designed for easy removal when changing products or performing routine sanitation. Sanitary design is particularly important in today’s processing environment where customers are continuously changing between products or varieties. LMC offers several different product contact materials for total customization in order to ensure adherence to the customer’s food safety specifications. Versatility is a trademark the LMC Stoner. An array of options such as stainless steel contacts, dust hoods, VFD controls, and multiple deck configuration are offered to suit the needs of every customer. Several different models and sizes of stoner are available o achieve desired capacities. LMC Stoners are currently being utilized in the edible, seed and recyclable industries. A more complete and distinct product separation is achieved with the superior traction provided by the rippled deck insert. Utilizing a high efficiency bottom fan, the Roca series stoner enables the user to make precise air adjustments with one simple control. Multiple air adjustments are not necessary to obtain proper bed fluidization. The Roca series stoner is offered with a discharge system to meet every need. Decks with individual discharge gates or automatic discharge systems are available. All LMC stoners are eccentric driven and fully counterbalanced. This reliable system eliminates unnecessary vibrations therefore lengthening the life of the machine and reducing energy costs. All working parts are enclosed so there is less risk of injury during operation or while making adjustments.